Home › Barack Obama › Should America go BARACK to the FUTURE or FORWARD to the Past? 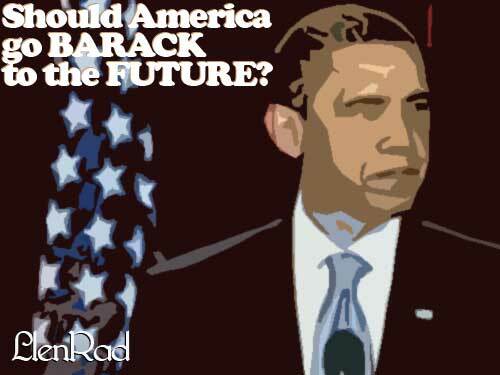 Should America go BARACK to the FUTURE or FORWARD to the Past? America’s journey has found a stretch of extremely rough terrain and uncertain footing in 2012. A long trip that has been like a roller coaster ride since September 11, 2001 has now lost steam and seems stuck in the mud. Eleven years after the attacks of 9/11 on New York, DC, And Pennsylvania is it time to reflect on how far we have come? What about the direction we are headed? Do we remember where we came from? What is it that we are supposed to be doing, here, in America? In 2009 Barack Obama wanted to squelsh any ideas of questioning the events of 9/11 by stating in a Cairo, Egypt speech to the Muslim world, “Let me be clear. Al-Qaeda killed nearly 3000 people on that day…“. OK Barack we got it, what Bush said, thanks. In 2012 Barack Obama now openly and secretly supports rebels who the press continuously reports as linked to Al-Qaeda. WOW, What a difference a few hundred days makes. This places the American journey at a major crossroads. The Obama campaign slogan in 2008 was HOPE & CHANGE, in 2012 it’s FORWARD. The question is, Forward where? How do you know when we have gone too far? Where is it that we are supposed to be going anyway? What if we are headed for a cliff with too much speed? How will we know, when it’s too late to turn back? The “War on Terror” now encompasses the Middle East, parts of Asia and Africa, Europe and North America. American troops have been sent to Afghanistan, Yemen, Philippines, Ivory Coast, Iraq, Georgia, Kenya, Ethiopia, Eritrea, Pakistan, Lebanon, Somalia, Libya, and Uganda. How much you got? Well someone must think we have plenty more where that came from. So far this War on Terror has cost as many as 1.1 Million people their lives. Over 50,000 Americans have been wounded or killed. Add to that another $5.4 Trillion dollars in defense spending and you should have a idea of the cost of this global worldwide whole earth terror war. So now because of “terrorism” protesters have to get SETUP by police. Women have to get beat up by cops for talking on their cell phones. Kids have to have somebody from the government approve what’s in their lunch box. Retired Marines with heart problems have to be shot by police for accidentally calling for medical help. People have to get fired from their jobs for comments on Twitter, a website that wasn’t even in existence in 11 years ago. A women has to be kicked off an airplane for not happily letting government TEST her drink she purchased from the AIRPORT, AFTER the checkpoints. It really is crazy. The only thing that is crazier is the idea the Mitt Romney would fix things. Who really believes anything this guy says? What do you think can be done? How can America get back from this insane future? Will we need a time machine? ‹ The first Tuesday September 11th Since 2001 – Five questions people are asking.